Posh boss Grant McCann (left) and his former assistant Lee Glover. Photo: Joe Dent/theposh.com. Peterborough United manager Grant McCann reckons the club will ‘unite quickly’ following the surprise departure this week of assistant boss Lee Glover. McCann broke his silence today (March 23) on the loss of an assistant he hand-picked last summer. Posh chairman Darragh MacAnthony (left) is seeking an experienced assistamt manager to help Grant McCann. 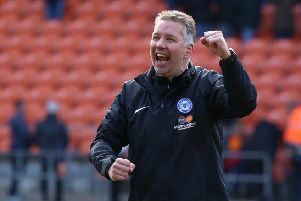 The Posh boss expressed ‘disappointment’ at the sacking of a ‘good man and friend’. but he insists he and the players have to move on quickly if they are to enjoy a successful end to a frustrating League One season. Glover was axed by chairman Darragh MacAnthony - McCann was coy about the level of his involvement in the decision - on Monday (March 20) to make way for an experienced assistant manager. That appointment will be made in the summer. For the rest of this season McCann will be helped by fellow Posh legends Mark Tyler and David Farrell, starting with Saturday’s (March 25) League One trip to Gillingham. McCann said: “It’s disappointing to see a good man like Lee Glover lose his job. I did say a few weeks ago that everyone at the club was under scrutiny, including myself. Posh goalkeeper Luke McGee is expected to play at Gillingham. “The chairman owns the club and he can make whatever decision he likes. I’m grateful he is still showing faith in me and I am determined to repay that faith. We haven’t been good enough from January onwards. That’s the management staff and the players. “I’ve been in this situation before and the rest of the club needs to be strong enough to react well and move on quickly. I had a good chat with the players on Monday after the decision was made. They are also disappointed, but we are all professionals and we have to get on with things. “I sensed there was great unity between the staff and the players after we’d finished the meeting. We are committed to enjoying a strong finish to the season. “That’s all I really want to say on the matter. Lee made a statement and (director of football) Barry Fry made a statement for the club and I don’t want to add to that. On-loan Spurs goalkeeper Luke McGee is expected to return to the Posh starting line-up at Gillingham, but fitness doubts remain over forward Paul Taylor and central defender Ryan Tafazolli.